So after innumerable rants, riots, laughs, tears, and glaring factual inaccuracies, Eamon Dunphy is leaving RTE. Eamo dropped the news via his podcast's Twitter account, in which he confirmed that he will not be renewing his contract. If his version of showbiz is to leave 'them' wanting more, Dunphy seems to have got his wish as he confirmed on Twitter that RTE offered him a (small) raise in order to renew his contract but he elected not to sign it. 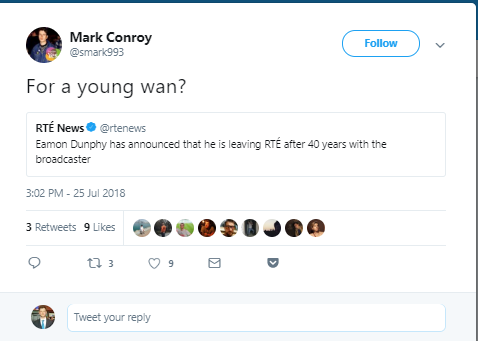 It's not exactly a sentiment shared by all viewers as there's been a sharply divided reaction to Dunphy's departure. Here's a reflection of the wider attitude. Bit conflicted on Dunphy leaving. Yesterday's man no doubt but the role of Eamon Dunphy was never really to be a fountain of knowledge. His role was always to just be Eamon Dunphy. Will eamon Dunphy now run for president? Nothing will beat the days of Bill O’Herlihy, John Giles, Liam Brady & Eamon Dunphy on RTE. It’s mad that Liam is the only one left on the panel. I thought the day would never come, now it has. Eamon Dunphy will be leaving @RTEsoccer after a career spanning over 4 decades. He will be a tremendous loss to broadcasting. Give Dunphy plenty of stick, but he'll be missed all the same. People willing to say something and risk being wrong more entertaining and interesting than those who play it safe. Eamon Dunphy is retiring?? Alleluia.